“It was a privilege to help out at the giant Electric Corby inflatable dome at the Corby Carnival and Corby Highland Gathering and spend time with Joe Dickinson, Sara Earl and Hazel Lowfield chatting to Corby folk about the benefits of Community Energy. 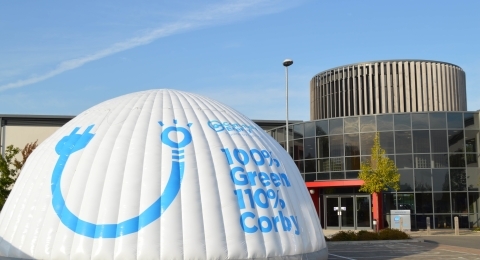 There was a lot of interest in the Electric Corby Community Energy programme, where anyone can get low-cost electricity from renewable sources whilst generating profits that go to Corby-based charitable groups. I think many people might like to help the environment, yet do not want to increase their already huge electricity bill. When they found they could get “green” electricity while decreasing their costs, they were pleasantly surprised, particularly as anyone can be a part of this scheme, regardless of where they live and how they pay their bill.